Save $$$ with Helmar direct prices when you buy online! 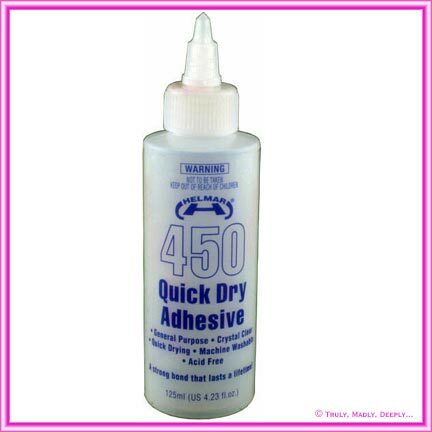 Helmar 450 Quick Dry Craft Glue 125ml Bottle - the perfect DIY glue for all types of papers, card, ribbons and small accessories and is the same glue we use to make our professional wedding invitations. Not only does it dry clear and very quickly, it won't ripple your beautiful papers or ribbons. Performance is similar to Helmar Premium Craft glue but it dries quicker - which saves a lot of time when gluing repetitive products like wedding invitations. Does not bleed through ribbons, ric-rac, fabrics etc. Tested on & recommended for all Paperglitz papers and cards. This glue is essential for those gluing tabs on die cut greeting cards like pockets and pouches. A must have for anyone making wedding invitations, general invitations and scrap book enthusiasts. Great for bridal wear, costume making, lampshade making, millinery work, paper crafts and general household use. Ships by Road Freight Only - Express Post or Air Mail is not available with this product. I got all the materials from you for our wedding invitations and they looked amazing. I just wanted to say thank-you to Maria who helped me choose them and organise them i truly appreciate it.